Darrin is one of two Co-Pastors at Kingsview FMC, his areas of responsibility include Administration, Missional Leadership and Vision. In addition to his role as pastor, Darrin also serves as Network Leader for the Toronto West Intercultural Network of the Free Methodist Church in Canada, a group of pastors leading ethnic, multi- and intercultural congregations. Prior to vocational ministry roles, Darrin worked for 8 years professionally as a Certified Kinesiologist and served for several years on the Ontario Kinesiology Association’s Board of Directors. In 2004, he joined Youth Unlimited (TYFC) in Toronto and served in partnership with Kingsview FMC as Youth and Community Pastor, developing neighbourhood programs and partnerships that have impacted and/or continue to impact children, youth and families in Kingsview Village – The Westway. 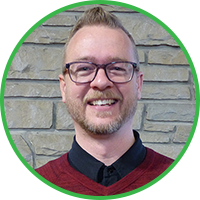 Darrin was appointed as Associate Pastor at Kingsview in 2008, ordained by the FMCiC in 2013, and selected as the Transition Pastor in 2014-15, prior to his current appointment. Darrin’s formal education is an Honour’s Bachelor of Science in Kinesiology from the University of Waterloo (1995) and a Master of Theological Studies degree from Tyndale Seminary in Toronto (2000). Further studies have included certificates and/or courses in radio broadcasting, community assessment, program evaluation and non-profit management to name a few. These pastoral and leadership roles fit Darrin’s passion for social justice and his heart for multiculturalism like a glove. From advocating for marginalized people groups to repairing bicycles for neighbourhood children, Darrin sees the local church as a vital agent of transformation for people and communities. This isn’t an arm’s-length venture, Darrin, his wife Sharon, and their daughter Adaline call Kingsview Village home. 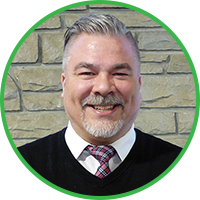 When not at work, Darrin can be found with his family visiting local parks, splashpads and beaches, exploring the diverse activities, concerts and restaurants Toronto has to offer, or cooking at home for family and friends. Darrin, Sharon and Adaline also love travelling and music; Darrin enjoys reading, movies and his vinyl record collection. Pastor John-Mark Cockram is an ordained minister of the Free Methodist Church in Canada. He is currently Co-pastor of Kingsview Church and provides leadership and support to the Discipleship, Care and Worship ministries. John-Mark was raised in a loving Christian home and nurtured in faith at Emmanuel Baptist and Willow Creek Baptist churches in Barrie, ON. He was baptized at age 13 and began theological studies at Briercrest Bible College in Caronport, SK after high school. After a year in the West he returned home to complete his BA in English at York University. He met Loreli at Willow Creek and they were married shortly afterward. J-M completed teacher’s college at the University of Toronto and taught intermediate grades for seven years in Barrie. During this time J-M and Lorelii were raising their daughters Mallory and Sophia and attending Barrie Free Methodist Church under the leadership of Cliff Fletcher. At BFMC, God called them both into deeper service to the kingdom, especially in the area of global missions. The family served for two years in Ghana (2006-2008), where they built the relationships which led to FMCiC oversight of the Ghana Mission. On returning to Canada, J-M was appointed Associate Pastor at Barrie FMC where he served for 6 years before accepting the position of Co-Lead Pastor at Kingsview. He is currently completing a Masters of Divinity at Tyndale Seminary. J-M remains a teacher at heart and loves to help people understand the Bible and to live it out. He loves to see the church embrace the rich cultural diversity of its members. Collecting and reviving obscure Christian music and playing and singing songs that have the depth and power of the Psalms is one of his ongoing passions. Deep conversation about the interaction between the Good News of Jesus and culture fascinates and stimulates him. Recreational cycling and swimming are his favourite outdoor pursuits, along with reading a good book on a sunny Ontario beach! Browsing a used bookstore or exploring a downtown shop keep him busy on winter days off. As the church administrator, Nina plays a key role in keeping Kingsview organized. Her past experiences working within the customer service industry shows whenever you communicate with her, she has a positive attitude, she has a positive attitude, cheerful demeanor and is always willing to help out! 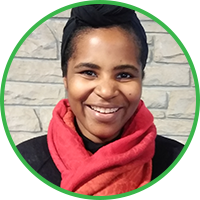 Having graduated from Humber College with a diploma in Business Management has given Nina a solid understanding of how to run the church office and manage volunteers while staying on top of a variety of different day-to-day tasks. Outside of work, Nina enjoys spending time with her family and close friends. She is also excited about a new business venture she has started with her little brother. Nina chose to work at Kingsview because she is committed to using her gifts and talents to positively impact God’s Kingdom.